When I was young, I was pinched a lot on St. Patrick’s Day. Since my family was not Irish, I always forgot to wear green until I got to school. It’s one of the reasons I bought green shamrock stickers when I was a teacher to give to all my students who weren’t wearing green! On St. Patrick’s Day, we say that everyone is Irish, whether you really are or not. The people that I know who are Irish are fiercely so; they are proud of their Irish ancestry. In this melting pot that is America, perhaps the rest of us just want to fit in with the Irish on this one day of the year, although I have to say I think Ed is only in it for the corned beef. I had never cooked corned beef until I married Ed. I actually think that was the first time I had ever eaten corned beef. And oh! It tastes so good! I’ve also made boiled cabbage, which I didn’t care for. I prefer cabbage cooked a different way, in the way my ancestors made it. When I was growing up, the only German meal my mom made for us was sausage, sauerkraut, and mashed potatoes. I still love it, and I make it for my family when I get a craving for it. We don’t really have a special day when we eat sausage and sauerkraut, but we do share something with the Irish: beer. While Guinness is a little too dark for me, Ed and I used to drink either Bass (Irish beer) or Hacker-Pschorr Weisse (German beer) every Saturday night after church. So I guess when we were in church looking forward to our beer, we were doing the opposite of what Martin Luther said: “I’d rather my people were in the alehouse thinking of church, than in church thinking of the alehouse.” It’s said that Luther loved his wife’s home-brewed beer. My grandfather, a proud German, drank half a beer with his lunch, and the other half with his dinner. He said that beer was good medicine, and he lived to be 96 years old. While I’m usually staunchly German like my grandfather, I’ve always loved this Irish proverb. Perhaps I love it because the ending, “And until we meet again may God hold you in the palm of His hand,” reminds me of my uncles. They say instead of goodbye, say until we meet again either here on Earth or in heaven above. What’s your ancestry? Are you Irish on St. Patrick’s Day? Tell me in the comments below! I have tried some beers in my life and even though I do quite like Guinness, I can only drink about half a pint of the stuff. I usually go for the lighter ones. Pils as they call them in Germany and the Netherlands. Here in Norway I don’t really drink anymore. At least not beer. Next month however, I will be in Northern Ireland, so I will probably try some nice beers or ales. Have a great time in Ireland! I’m sure you will be able to drink a lot of good beer there! Lately I’ve been drinking wine more than beer, not that I’m a big drinker. 😉 Pinot Noir has been in my glass after the kids are in bed and I sit down to watch a little TV. I am 100% Bohemian and we never celebrated St. Patrick’s Day. I made corned beef/cabbage for the first time last year and some Irish soda bread. I agree with you, I have always liked that proverb too! It is such a nice one, don’t you think? By the way, I didn’t realize there was a new Muppet Movie coming out. I’ll have to take my girls! Did you see the one with Amy Adam and Jason Segel? One of my favorites! Yes, we did see that one! We really enjoyed it! That was a great story! Thank you for sharing that memory! Kristina Walters @ Kris On Fitness recently posted…Sunshine Awards! Yay for corned beef! I get waaaaaay too into St. Patrick’s Day every year, I just can’t help myself, which is probably bad since my husband and I are both primarily Scottish! Nicole Hallford recently posted…Quick Takes! Ha, that’s too funny! The older I get, the more I enjoy celebrating St. Patrick’s Day! Love your post. The area we moved from had a nearby town named Freistatt, MO. The area was Lutheran and German dominated to the point that German was spoken in public until WWII. Then it was reserved for only within the home. It is a farming community mostly. For the past 40 years the Lions Club has held an Ernte-Fest complete with a beer garden. We have partied and polkaed with dear friends and family many a hot August night at that Fest. The last time we went, there was a horse drawn carousel. What great memories! The town where I grew up in Central Illinois still had German services at church on Reformation Day. We didn’t speak German, but knew certain prayers in German. A horse drawn carousel sounds so fun! I like it! We had orange day on Friday at the preschool where I teach, and so we all wore orange. It’s a very cheerful color! We rarely do anything for St. Patrick’s Day either. Although, I hope I see a leprechaun in Vegas that day. 🙂 Now you’ve made me hungry for sausage, sauerkraut and potatoes! Vegas sounds like a fun place to spend St. Patrick’s Day! Good Luck! Jude never has to worry about the wearing green thing because his school uniform has a green shirt with a shamrock logo! 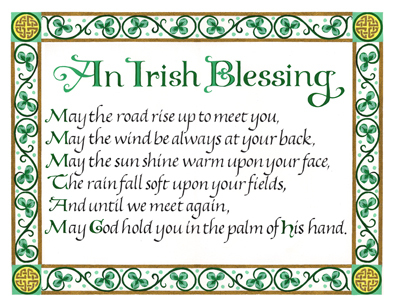 I’ve always loved that Irish blessing too! Well, there you go! 🙂 My youngest is very concerned that she doesn’t have a green shirt. I’m sure I’ll be able to dig one up for her somewhere. I don’t think I’m at all Irish, but my kids might be because my husband might be! He has completely different mixes than I do in my bloodlines. I love the time of year. I LOVE corned beef (had it for the first time while pregnant and now I do it annually). I love rainbows and shamrocks and good luck charms. tamaralikecamera recently posted…I’m Just A Small Town Girl..
Like you Ginny I am of German descent. St. Patrick’s Day does hold a special place in my heart tough. It was the day we launched our web site, 16 years ago!